Minerve, consisting of Daniel Wollatz and Mathias Th?rk, are definitely a newcomer-sensation onto a new level of music. 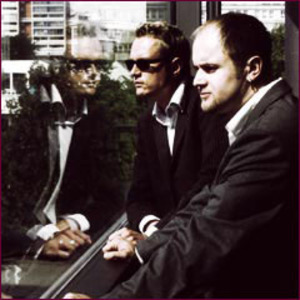 After releasing their first album "Breathing avenue" in 2004 they captured the hearts of those, who not only listen to electronic sounds. They offer you danceable, catchy tracks like "Clear" and "High pitched emotions", but also offer you time for dreaming with "Suffocate" or "Afraid of myself". Minerve captured Eastern Europe incredibly fast: Their special edition of their debut?s got sell rankings, exceeding world stars. During an interview they?ve even had to enlarge the radio?s hotline capacities, after Daniel?s liveperformace on air. This fact shows, that music made by synthesizers neither necessary has to be chilly electronic nor old-fashioned and artificial. Their music has always been lively and full of innovation, that makes Minerve unique. They live their music and want to experience it with their fans. Always openminded for new impressions, they don?t feel like belonging to any scene or any special style of music, but want to broaden their minds and want to capture new worlds. Surely they are a contrast to the common rock music, but with their performance and their professional drummer Minerve appear as a serious rocking live band. Especially for that reason Minerve supported either bands like The Cr?xshadows, Iris, Psyche, Spektralized, Lowe or were a part of mass events like the Night of Fights, Party for the Masses or Pluswelt Festival where they could show all of their qualities in front of hundreds of fans. In 2005 the band was also nominated for the "Deutscher Rock & Pop Preis" in the category "best electronic pop act" and reached the third position at this mainstream event.